I ILLed this one because while my library has the sequel, Vienna Blood, it doesn't have A Death in Vienna, which is the first in the Liebermann Papers series. Grrr. Due to the strangeness of the crime, Detective Oskar Rheinhardt calls in his good friend, psychoanalyst Max Liebermann, to assist him in questioning the members of the seancé circle. I enjoyed this one very much -- certainly enough that I'll be bring Vienna Blood home tonight, as well as requesting that the library buy the third book in the series when it becomes available. Max Liebermann's style of detection relies on his training as a psychoanalyst as well as his Sherlock Holmes-like talent for observation. So I loved that aspect of the book. There's a secondary plot involving his fight to treat the multiple personality disorder of a (beautiful young) woman with psychoanalysis rather than electroshock therapy, and then there's his love life, which involves the very silly, very beautiful (somewhat immature) Clara. There was a whole lot going on, and while I figured out whodunnit about halfway through, I didn't figure out HOWdunnit. It IS one of those books in which it is clear that the author did loads of research about the era and seems determined to put it all in the book, regardless of whether or not it's necessary. 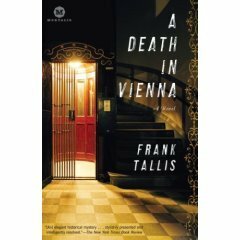 So there were little bits about life in turn-of-the-century Vienna that felt forced and somewhat extraneous, but A) I like learning about stuff like that and B) I enjoyed the characters and the mystery enough to give him a pass. Hopefully the second book will feel less choppy.